The cell. 6. Cholorplasts. Atlas of plant and animal histology. Chloroplasts are organelles found in plant cells. Chloroplasts are composed of outer membrane, inner membrane, intermembrane space between them, inner space, referred as stroma, and membrane sacs, known as thylakoids, which are organized in stacks and localized in the stroma. Chloroplasts carry out photosynthesis: transformation of the electromagnetic energy of the light into chemical bonds of organic molecules. Photosynthesis is accomplished in two stages: a light-dependent part where light energy is used to synthesize ATP and NADPH, which happens in the thylakoidal membranes, and a light-independent part where carbon from CO2 is covalently linked to ribulose-1,5-bisphosphate, which happens in the stroma. Chloroplasts are usually large organelles (1 to 10 µm) present in plant cells. A cell from a leaf may contain from 20 to 100 chloroplasts. The shape of chloroplasts is variable, from round to ellipsoid, or much more complex. Chloroplasts are members of the plastids family and contain DNA, around 250 genes derived from the prokaryotic ancestor (see endosymbiosis). These genes code for ribosomal RNA, transference RNA and messenger RNA. In the interior of the chloroplast, proteins needed for the growth and division, and for photosynthesis, are synthetized. 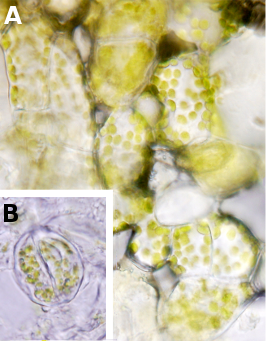 Chloroplasts of a photosynthetic parenchyma (A), and in cells of a stoma (B). Chloroplasts are composed of outer membrane, inner membrane, intermembrane space between them, the inner space is known as stroma and contains many membrane sacs known as thylakoids, arranged in stacks. Chloroplasts are made up of several compartments. In the periphery, there are an outer membrane, an inner membrane and an intermembrane space between them. Unlike mitochondria, the inner membrane is not folded. Inside chloroplasts there are membrane sacs known as thylakoids, which are usually arranged in stacks referred as granum. Thylakoids of different grana (plural of granum) may have continuous membranes. Proteins in charge of photosynthesis are located in the membrane of thylakoids. The space between thylakoids and inner membrane is known as stroma, where DNA, enzymes, ribosomes, and other types of molecules are found. Photosynthesis is the main role of chloroplast: transform the electromagnetic energy of light into chemical bonds thanks to chlorophyll, ATP synthase, and ribulose-1,5-bisphosphate carboxylase/oxygenase (RUBISCO). Photosynthesis is divided in two stages: a light-dependent part, where the energy of light is transformed in a gradient of protons, which is used to produce ATP and NADPH, and a light-independent part (it does not need light but the products generated during the light-dependent stage) where carbon from CO2 is fixed on phosphated carbohydrates by RUBISCO. The first stage of the photosynthesis takes place in the thylakoidal membranes and the second stage in the stroma. Summary of the main steps during light-dependent stage of photosynthesis. All proteins are transmembrane or associated to the thylakoidal membrane. Protons are moved to the interior of the thylakoidal sac, whereas ATP and NADPH are synthesized toward the stroma. The split of water contributes to the proton gradient by increasing the amount of protons in the interior of the thylakoid. Photosynthesis consists of several steps. a) Photosystem II splits two molecules of water that yield one O2 molecule and four protons. This reaction releases four electrons that are moved to the chlorophyll molecules of the photosystem II. There, the energy of light raises the energy of these electrons and so they are released from the photosystem II. b) The electrons are catched by a plastoquinone and quickly donated to cytochrome b6/f complex that uses the energy of electrons to enter four protons into the thylakoid. c) Cytochrome b6/f complex gives the electrons to a plastocyanincomplex gives the electrons to a plastocyanin that transfers them to the photosystem I. Here, again, thanks to the energy of light, chlorophylls raise the energy of electrons. Ferredoxin-NADP reductase is associated to photosystem I and transforms molecules of NADP+ into NADPH, which remains in the stroma. The protons which are removed from the stroma and those that are produced or entered into the thylakoid create altogether a proton gradient across the thylakoidal membrane. This gradient is used by the ATP synthase to produce ATP. Since the catalytic center of the ATP synthase is facing the stroma, the new ATP molecules are synthesized into the stroma. Both NADPH and ATP are eventually used in the Calvin cycle, which is a metabolic chain of reactions where CO2, ribulose-1,5-bisphosphate, and RUBISCO make possible the fixation of carbon into phosphoglycerate. Besides photosynthesis, chloroplasts carry out many other salient functions like the synthesis of amino acids, nucleotides and fatty acids, the production of hormones, vitamins and other secondary metabolites. They also take part in the metabolism of nitrogen and sulfur. Some metabolites they produce are involved in the protection against pathogens and in the plant adaptation to stress, excess of water, and extreme heat. By releasing hormones, chloroplasts may also influence cell located far away in the body plant. Chloroplasts are in permanent communication with other compartments of the cell, either by sending molecular signals or through direct contact between their membranes. It is relatively frequent to observe physical contacts between the chloroplast membrane and the membranes of the endoplasmic reticulum and mitochondria. However, the more intense communication is with the nucleus because the nucleus contains many genes for proteins that must work inside the chloroplast, some of them needed for photosynthesis. In this regard, nucleus and chloroplast must be well coordinated because they have to work together.